that died before Jesus came. The countdown has begun and there’s no stopping it now. It’s the End of the World as we know it... The World of Darkness®, that is. Vampires, Werewolves, and Mages, oh my! The Time of Judgment™ is at hand. White Wolf Publishing has decided that their 13 years of gothic role-play Storytelling have run their course. All good things must come to an end. And it has been a good run, in my opinion. I discovered Vampire: The Masquerade® in 1992. I had played other role-playing games in the past, but never got into dicebased hack-n-slash type games, like the original D&D and its variants. TSR’s Forgotten Realms™ attracted me because there seemed to be a developed world to get into. My favorite novel of all time is still Azure Bonds by Jeff Grubb and Kate Novak and is based on that world. When TSR released the gothic/vampire based Ravenloft® RPG system and novels, I became even more pleased. But I think I fell more in love with the novels, like I, Strahd by P.N. Elrod, than actual game play. One day, a friend I RPG’d with told me about the Storyteller- heavy RPG system involving vampires by this new company called White Wolf. Immediately after reading Vampire: The Masquerade, I fell in love with the World of Darkness universe. Here was a game system that was focused on a Story Teller, not a Game Master. This was interactive fiction in my estimation, like Infocom® games of old. In Masquerade, the characters’ history was more important than the stats. The situations and encounters were more interesting than the dice rolls. Moreover, the dice that were rolled gave more realism and empowerment to the story. The different personality types were easily identifiable to the players. Depending on my moods, I either played a lonewolf Gangrel or an impish Malkavian. My characters were flawed heroes with a tormented, haunted past. After a while, I preferred being a Storyteller over being a player, because it allowed me a creative freedom I never experienced before. Everything comes full circle. Now more than a decade later, I find myself rediscovering the World of Darkness. After a few years of not playing, and not writing as much, I wanted to find out what new material existed. 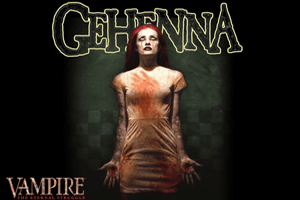 To my shock I discovered that Gehenna has finally come to destroy the Vampires in my precious gothic universe. Moreover, White Wolf will cease publication (including reprints) of all World of Darkness game book lines by April 2004! The Garou werewolves have fought their last battle against the evil of the Wyrm in their Apocalypse. The Mages will have their Ascension finally. All of the creatures of the night will finally get their last bump. Gehenna was foreshadowed in the original Masquerade books because they knew even then that every good story has a beginning (their foundation), a middle (our games), and an end. It would be anti-climactic to not write a chronicle game-setting for how to play The Last Night. I bought Gehenna without a second thought and took it home to read it. I swallowed it whole as I took in the meaning of it all. It opens with a short story to set the stage. Typical for them, and as expected it was well-written. The artwork throughout the book also lives up to their standards for dark eye candy. The next chapter then breaks from the norm, and essentially spells out everything that you will read in the rest of the book. It is all very vague, intentionally one would presume, to act as a spoiler yet not give away any plot. In the end, they preach their usual speech of, “this is your story, play it your way” by giving you just enough background for your creative license as a Storyteller. I did love the background info bites though because they summed things up well. My favorite was the following about the Camarilla on p. 17. The rest of the book contains four meta-plots for how you can play Gehenna in your games. The first one was my favorite. It was the simplest to fold into a story, involving all of your players, and has a satisfying redemption in the end. It has a very Book of Revelations feel to it as it directly uses the comet Wormood as the tool of God’s wrath, thinning the blood of the vampires to non-existence. However, a group of vampires, including presumably your coterie of players, make their way to a church where they get locked in for 40 days. If they can survive in there, they can find salvation and become human again. This may be thick in Judeo-Christian mythology, but it is justified because the “origin” of these vampires borrows directly from Genesis. So you don’t want the whole bible-thumper version of The End? The remaining three stories are satisfying as well, but have a more H.P. Lovecraft feel as the ancient Antediluvian vampires return to destroy their progeny, but most of them hardly resemble vampires anymore. The Tzimisce Antediluvian, for example, is a giant hunk of flesh that emerges from underneath Manhattan to devour everything in sight. Paging Dr. Cthulu! In my mind, the satisfaction of the last three comes from finding Lilith playing the role of vengeful wrath-giver. But the satisfaction ends there, because as a player in a game that would use these tales for Gehenna, there is really very little to do. Your players end up following the main NPCs around, requiring little interaction for choices. They may make great fodder for White Wolf’s novels, but not a satisfying game. It might make a good movie, though. The best advice then, it seems to me as a Storyteller, is to take all of the best elements of all meta-plots, throw in some of my own old stories, simmer in a pot, and serve up a new story. That is the best use of these chronicles, and White Wolf even encourages it. Would I recommend buying the book? As a source book for playing the end of the world, it does a great job, does answer some questions and ties a few loose ends. But not enough loose ends. The stuff it misses makes everything that came before it seem like a red herring, and that is disappointing. O.K., so they can’t resolve everything… that’s what novels and video games are for, right? This book should have tried to though. Instead of the last three stories being different flavors of the same story, they could have consolidated and made a true “sliding-scale” of doom, then made a final chapter of resolutions. Here they could have answered all the questions they raised for 13 years, and even said honestly things like, “Yes, Sam Haight was a red herring. He really is dead. Move along, nothing to see here.” This gripe is the reason I did not give the book a perfect score. For the rest of the stories, the quality of the writing, the value of knowing at least a few ways Gehenna will come, and having a sense of closure, I give it 4 full moons. Now that I have said all that, I have this nagging feeling like this is all a Malkie prank. Would White Wolf really stop printing their award-winning, best-selling, generationdefining, money-making venture, the day before April Fools’ Day? Yes… and no. Hah! See, I knew it! If I can be allowed to be cynical, let me just say this is the best marketing plan I’ve ever seen! Build up a following, produce a great gaming universe, publish tie-in novels, license video games, make TV shows (admit it, you watched KINDRED: The Embraced, too… please admit it… O.K., fine, I’m the only one who watched it. More over, I bought the DVD of the series! Mmmm… Stacy Haiduk.) Then build up to an apocalypse and follow through by ending publication of everything. Even their online store closes up shop on March 30th. It’s an eBay-lover’s dream. An instant market for rare, out-of-print books. Plus, loyal fans will run out and buy all the books left on shelves because they know they won’t be able to get them ever again, except through eBay and used book stores. Finally the crowds will demand, “Oh please gothic gods of the game, give us more!” Well looky-here, they’ve revamped the World of Darkness. Yup, in August 2004, the all-new blacker-than-black World of Darkness will emerge. New rules, new creatures, new game. Sure it will probably be similar, for the “old-school” groupies, and still give a new generation of gamers a fresh game to play. If possible, hell, it might even be better. Now everyone will go buy the new game system to see what WoD 2.0 will be like. Marketing pure and simple. But marketing that worked. I bought the book. I’ll probably buy the tie-in novel to see how the author envisioned Gehenna. I’ll probably buy the new WoD game starter to see how it all comes to fruition. The cycle begins again, my friends. I should have seen it coming. “I’m going back into Torpor. This article is dedicated in loving memory to Peg “Stargazer” Field. "Gehenna" is a Greek word, which comes from the Hebrew "Gai-Ben- Hinnom", meaning Valley of the Son of Hinnom, but was often shortened to "Gai-Hinnom". This valley was a garbage dump outside of Jerusalem. It was a foul-smelling place where refuse was dumped, and pyres burnt for the bodies of criminals, and in later times, sacrifices were made there that were considered abominable.The original Greek New Testament used the word "Gehenna" to describe a foul place of torment, which was translated to "hellfire" or "hell" in the King James version and others. The word "Gehenna" also occurs in the Islamic Qur'an as a place of torment for sinners. Author of Lilith's Love, Black Magic, and Once Upon a Scream. IS SILVER AN ANTIBIOTIC ALTERNATIVE?